It starts in a war, with these creepy hands that are dragging people under ground. It’s like zombies but the hands have eyes, well the Doctor goes there to save a little boy. When the little boy tells the Doctor his name Davros, the Doctor looked like the kid just told him his name was Hitler. Well pretty much because we later find out that this is the creator of the Daleks. Apparently Davros is dying, so he is hunting down the Doctor. No one will tell Davros lanky where the Doctor is, apparently the Doctor is hiding – pretending to be meditating. Clara notices that all the plane have just stopped, so UNIT calls her in. It seems that Missy is the cause of all the plane stopping mid air. Missy is not dead and has the Doctor’s last will and testament. Clara is not happy about any of this, but she has to deal with it. Also Missy is crazy and killing people because well she finds it fun. Clara is able to figure out when the Doctor is hiding, Missy teleports them there. 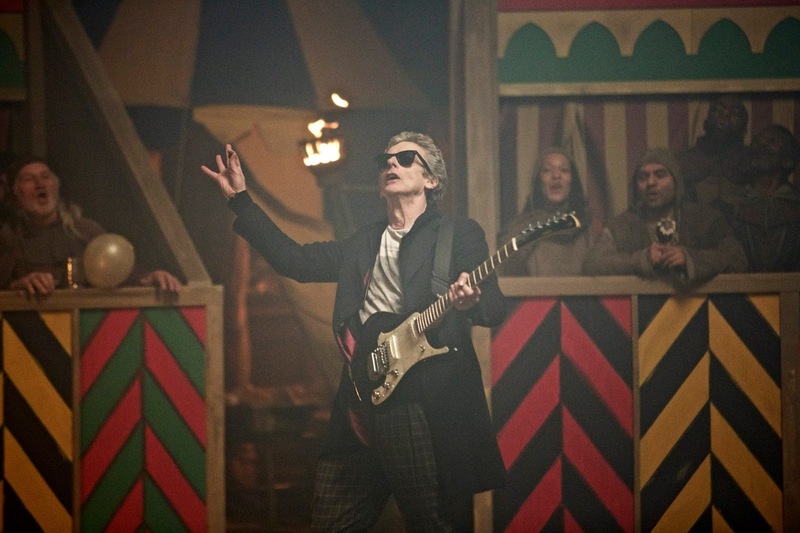 It seems that the Doctor, is teaching medieval people the word dude. He also goes to an ax fight on a tank playing an ax guitar. Which he finds to be the funniest thing ever, but the crowd well in a few thousand years they might as well. Well the Doctor sees Clara and Missy there, who he invites to meet the crowd. Missy is really excited about this, she even does a magic trick. 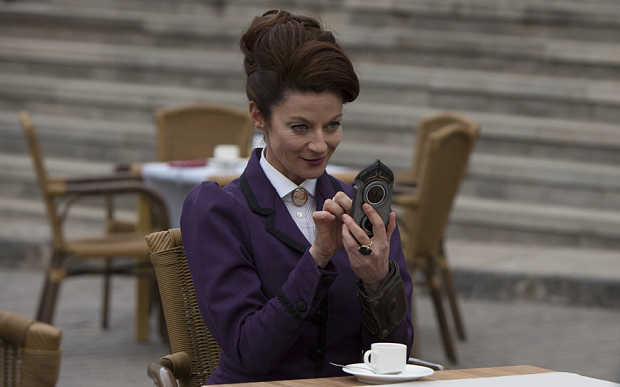 Oh, I know the Master was a bit off, but he is extra special as Missy, it is almost like a female Moriorty from Sherlock (BBC). Davros’s minion manages to find the Doctor and turns into a giant snake. Well once he reforms, the Doctor turns himself in and is bound by a snake. Clara and Missy refuse to let him go alone so they agree to be snake bound as well. The Doctor is taken to Davros who basically does not like the Doctor. I can’t blame him, the Doctor did leave him there to die. The Doctor left so quickly, he didn’t have time to get back his screwdriver. It seems that the creatures inside the Daleks are the people from the planet, possibly the hand creatures. 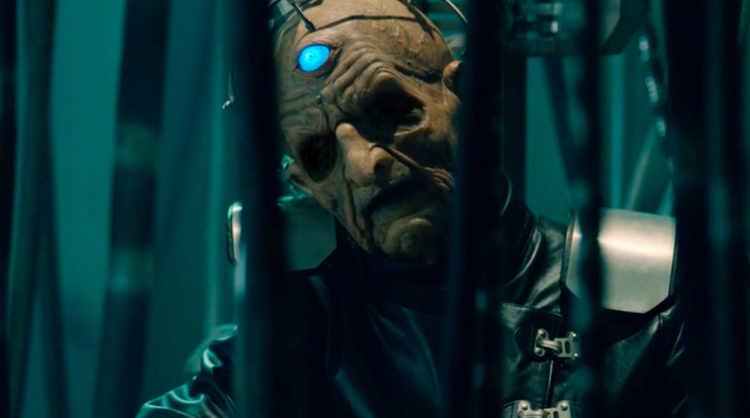 I am betting if the Doctor didn’t leave his screwdriver then Davros would have never the tech to build the Daleks. Or would he, because did the Doctor always leave Davros or was that a rewrite? Well Missy and the Doctor both realize that it is a bit odd that there is gravity on this floating space station hospital. That is because they are actually a planet, the planet of the Daleks. Can we talk about Miss singing and dancing in the jail cell, like seriously she is really off. I don’t know what regenerating genders does to a time person but apparently it messes up their brain. Well this leads to the death of both Clara and Missy, Missy was trying to convince the Daleks to go into the TARDIS with her. Since she is a Time Lady, she can take them through time anywhere, well that failed. Is Missy really dead, because she was suppose to have died last season but obviously that did not happen. The Daleks destroyed the TARDIS. The main thing I know for next weeks episode is that the Doctor is mad and ready to kill Davros for killing his friends. Well this was a good starter episode to the season, which is good since I was not a fan of how they introduced Capaldi but I still have not seen Old Who so I have been told that is why. 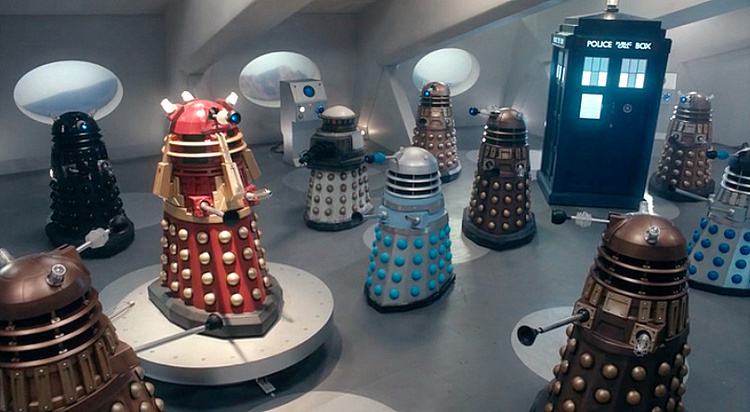 I like that they went into the history of the Daleks, seriously how did those things come to be. I always thought they hated the Doctor because he blew them up during the time war, but maybe they hate the Doctor because he didn’t save their creator, maybe its both. I have to say this is one of my favorite things about Doctor Who, the fact that they can make these philosophical questions happen. I don’t even like philosophy, but I like the questions that can posed through the show. 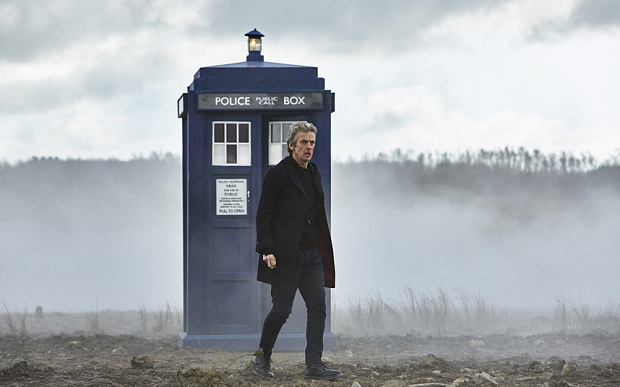 Until next episode when we find how the Doctor is going to save Clara and Missy. Posted on September 30, 2015, in BBC, Doctor Who, TV Show Reviews and tagged Daleks, Davros, Doctor Who, Doctor Who Magicians Apprentice, Doctor Who Magicians Apprentice Recap, Doctor Who S9E1, Doctor Who Series 9 Premiere, Doctor Who Series Premiere, The Doctor. Bookmark the permalink. 1 Comment.